TheBlueGuerilla: Uproar at Shipyard Job Losses. There's uproar in Portsmouth tonight at news of the loss of 940 jobs at Portsmouth shipyard. MPs of all parties are saying that its a politically motivated sweetener as regards the Scottish Independence Referendum and some people are even calling for Portsmouth North MP Penny Mordaunt to resign as Phil Hammond's P.P.S. 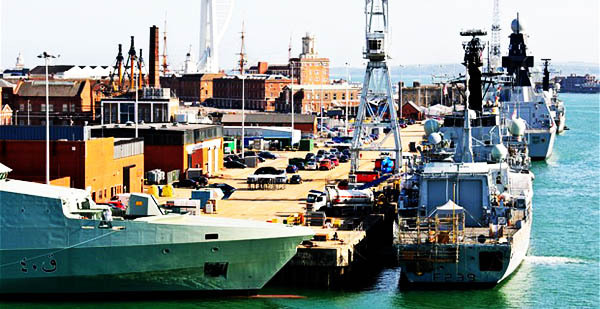 Navy engineers will still stay as support staff to Govern Shipyard and Portsdown Hill navy support at B.A.E. Systems will stay too. Portsmouth Council Leader Gerald Vernon Jackson just told tbg that he was "disappointed at the financial package on offer" saying that "it was nothing new." Portsmouth South MP Mike Hancock accused the M.O.D. Of "incompetence" and said it was "a decision the government would live to regret." And Gosport's Caroline Dineage said it was "devastating news". A new Facebook page calling on the government to save Portsmouth Shipyard was launched last night. Within hours the page had already got over 30,000 Likes. You've done a bit of a "Patrick Rock", that's the wrong Portsmouth in your picture. As in Portsmouth, USA, not Portsmouth, UK. I think a growing number of people might be thinking it should be "Portsmouth, UKIP".